Food Costs > How Much Does Maple Syrup Cost? How Much Does Maple Syrup Cost? Maple syrup is made from the xylem sap of sugar, red or black maple trees. It is often produced in cold climate areas, such as Quebec, Canada, a city that produces most of the world’s supply. This product is often used with waffles and pancakes, but it can also be used for French toast as well as an ingredient in baking. The price of maple syrup depends on the brand, its quality and where you purchase it. 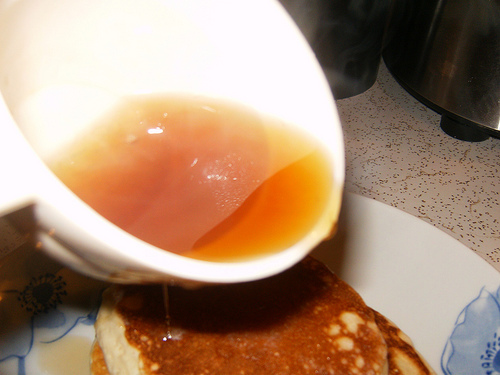 Maple syrup is usually sold in bottles and is graded differently. On average, a bottle of pure maple syrup can cost anywhere from as little as $7 per pint to more than $40 per half-gallon. This will depend on the brand, the quantity and where it’s purchased from. Some farms and retailers sell quantities are high as five gallons and something like this could retail for about $350, or something as small as a mini maple syrup bottle, which can retail for $3 to $5 for two ounces. Locals often sell maple syrup in a half-pint, pint, quart, half-gallon and gallon. Pancake syrup and maple syrup isn’t the same thing. Maple syrup will be made from the sap of a maple tree and then boiled down to reduce the water content, concentrating the sugars. As these sugars caramelize, it will create a maple flavor. It can take more than 10 gallons of sap to create just one quart of syrup. 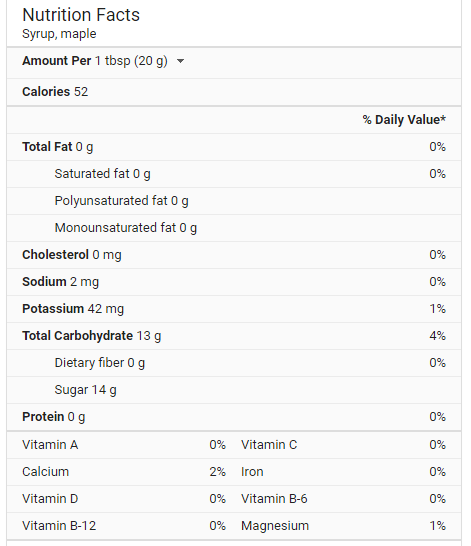 Pancake syrup, on the other hand, will be highly processed, using ingredients such as corn syrup, food coloring and preservatives, leading to a distinct taste difference between the two. A half cup of maple syrup has about 200 calories and close to 50 grams of sugar — the equivalent to a 12-ounce can of cola. Maple syrup will be broken down into four grades, as designated by the United States Department of Agriculture and each one will be a grade A, followed by a color/flavor description. These grades include the following: Grade A Light Amber, Grade A Medium Amber, Grade A Dark Amber and Grade A. VermontPureMaple.com tells us the grades will have nothing to do with the quality. This switch was rather recently done in 2015, and oftentimes, you may see older grades still sitting on store shelves. What’s the difference? Darker grades are known to be more intense, while the lighter colors can be sweeter. This grade will often be made in colder climates, usually around February and will be known as the first syrup being tapped for the season. This grade will be the lightest in color and will be the most delicate in flavor, allowing to you to really taste its flavor. A bit darker than the golden grade, this grade will be made in the middle of the season and will have a smoother flavor. Last to be tapped during the maple syrup season, this very dark grade isn’t sold individually; instead, it’s sold to factories to make things like maple candy. Since it’s so strong, it can often be used as a substitution for molasses; it’s that thick. With a robust flavor, and formerly known as grade B, the darker color grade will be much stronger and will have a deeper tint, similar to brown sugar, when compared to the prior two grades. Maple syrup should be at least 66 percent sugar in order to qualify as maple syrup. If you don’t feel like dowsing your pancakes with syrup, consider adding fruit to add sweetness and make them flavorful. Bananas, berries and peaches are all options you can consider as a healthy add-on. Once opened, maple syrup can sit in the refrigerator or a cool place for up to six months and still taste the same as when you opened it. Unopened syrup can last up to two years in a pantry and even freezing it may allow you to keep it indefinitely. If you’re buying a brand name maple syrup, look for coupons online either by searching or visiting the brand’s Facebook or official website. Store-branded maple syrup can still have the same great flavors and cost much less than the name brand products. For example, the Great Value maple syrup retails for about $7, while a comparable name brand retails for 30% more. With just about any condiment, the larger the container, the more you can save. For example, an eight-ounce bottle could cost close to $2.50 per one-fourth cup serving, while a 32-ounce bottle could be half that. Artificial maple syrup will cost less but remember it will taste much different because of its ingredients. Pure maple syrup will cost more due to the limited maple resources, the short season to collect and the process involved when collecting the sap from the trees. Maple syrup is also sold in 1.70 ounce glass leaf bottles formed in the shape of a male leaf. This has a robust maple flavor which is great for cooking, oatmeal and other cereals. They are sold for $18 to $24.